Earlier articles/reviews in this series were dedicated to Magdalena Kozena (1), who may be a real soprano, the "mezzo-contralto" Rebecca de Pont Davies(2), Malena Ernman�s splendid disc of cabaret songs (3)and the always-welcome Anne Sophie von Otter singing Chaminade (4). Von Otter, I concluded, is a superb example of a "typical" mezzo-soprano. I would like to temper that now by describing her as a typical "high" mezzo-soprano, with a type of voice which, while maintaining a mezzo richness throughout its range, is basically light and agile, the sort of mezzo who can excel in roles like Oktavian which are also sung by sopranos. If you turn to Katarina Karnéus�s new disc, you will hear another kind of "typical" mezzo-soprano. While I wouldn�t recommend her to call herself a "mezzo-contralto" as de Pont Davies does, this is an altogether darker voice-type compared with von Otter, a typical "low" mezzo-soprano. I reviewed Karnéus�s first disc, a recital of R. Strauss, Mahler and Joseph Marx in EMI�s Debut series (CDZ 5 73168 2) with some reservations, feeling there was still work to be done. I haven�t gone back to refresh my memory and I hardly wish to do so since the work has evidently been done now. What we have on this Sibelius disc is a young voice in all its first fresh glory. The only hint of the doubts I had before came in a few highish notes with a rather "white" tone in a lighter piece like "Tennis at Trianon", op. 36/3. For the rest everything is wonderfully even and controlled. The basic register has, as I say, a rich, dark quality which she can extend upward to an A or even a B flat. There is nothing of von Otter�s "lightness" in these high notes; true to her voice-type, Karnéus�s notes above the break are dramatic, thrilling, and magnificently stable. She can also offer some smouldering descents into the chest register. Another important aspect of Karnéus�s technical armoury is her avoidance of vibrato. Voices without vibrato can have an irritating choir-boy-like quality which the Italians call "fisso" � fixed. They can also seem out of tune even when they are not. This word "fixed" perhaps explains it, since it suggests the voice is somehow held steady so the vocal chords do not vibrate freely. Karnéus�s voice is, in fact, vibrant, not "fixed" at all, but without a trace of vibrato in the sense of "wobble". Vibrato in the wobble sense of the word can be attractive when the voice is fresh and young but it has a way of getting out of hand as time goes on (think of Bartoli); Karnéus exhibits a solidly-based, perfectly controlled instrument which should remain with her (and us, I hope) for a long time. I have quite deliberately avoided giving specific examples since the achievement is so consistent that virtually any song would do. Similarly, I don�t want to go into the interpretations more specifically than to say that she shows full commitment and embraces a range from gentle simplicity to the extremely dramatic (also this is a quality I was not sure about in the previous disc). Again, I do this because I don�t want to give the idea that some things stand out as better managed than others. In fact, pushed for time as I was, there were several songs where I just had to press the repeat button; but why tell you which, perhaps your favourites will be others? Those critics who did not share my reservations about Karnéus�s previous disc, let alone those who did, will surely be overwhelmed by this one which surely announces the arrival of a major artist. Karnéus�s EMI disc had a balance in favour of the voice that made Roger Vignoles appear a rather retiring partner (which I suspect was not the reality). Hyperion have provided a finely balanced recording and Julius Drake is strikingly rich in tone without ever dominating - they make a fine partnership. 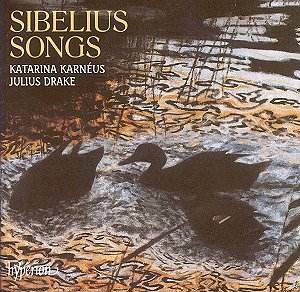 And a word about Sibelius�s songs. The general idea is that he was a great composer of symphonies and orchestral tone-poems who "also wrote" a lot of smaller pieces, the implication being that it isn�t very good. With a lot of the piano music this is alas the case, but his songs are highly individual and poetic creations, fully comparable with the work of contemporaries like R. Strauss, Mahler and Rachmaninov. If you don�t know them this disc will be an ideal introduction. And even if you have other recordings of them, why not treat yourself and add this? Informative notes from long-standing Scandinavian music champion Robert Layton, with French and German translations, texts in the original languages and English and a beautiful cover taken from a painting by Bruno Liljefors complete an issue for which I can find only praise.